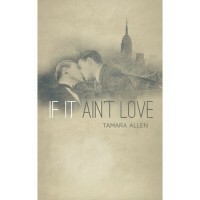 4.5, great little m/m romance story set in depression era Manhattan. Loved the writing voice, an author to watch. This was a quick read at roughly 30-40 pages, but it packed quite a story. I devoured this one and really felt the chemistry and love bloom between the two leads. I especially enjoyed the setting of the Great Depression. The author did a great job of painting the background and made you feel like you are right there. I recommend it to all who enjoy romance, not just the M/M stuff. This was a steamy and passionate read, but not erotica with explicit love scenes.